Cosmic rays are not the only sign of high energy particles in the distant universe. Additional evidence comes (like most astronomical data) from visible light and other types of electromagnetic waves, e.g. x-rays and radio waves. Such waves usually arise in one of two ways--by "photon processes" and by processes resembling the broadcasting of radio waves. Photon processes are related to the quantum nature of light, discovered only in the 20th century, by which light or any other electromagnetic wave is only created or absorbed in definite "energy packets" called photons. The shorter the wavelength, the more energetic the photon--for instance, since blue light has a shorter wavelength than red light, its photons are more energetic. Certain black-and-white films can be safely handled in photographic darkrooms illuminated by deep red light, because the red photons do not carry enough energy to initiate the chemical changes that darken the film. Photons of visible light have about 2 electron volts (ev), while medical x-ray photons may have energies of 50,000 ev and those of gamma rays reach 1,000,000 ev and even more. The arrival of (say) 50,000 ev x-ray photons from space is evidence of particles with at least that much energy, often much more, since each photon comes from a single particle. No process exists by which, for instance, ten electrons with 5000 ev each combine their energy to create a single photon of 50,000 ev. Photons of visible light have about 2 electron volts (ev), while medical x-ray photons may have energies of 50,000 ev and those of gamma rays reach 1,000,000 ev and even more. The arrival of (say) 50,000 ev x-ray photons from space is evidence of particles with at least that much energy, often much more, since each photon comes from a single particle. No process exists by which, for instance, ten electrons with 5000 ev each combine their energy to create a single photon of 50,000 ev. Celestial x-rays cannot be observed from the ground, because the atmosphere quickly absorbs them. They can however reach satellite observatories orbiting above the atmosphere, and several of those have mapped the x-ray sky--the small Uhuru and the larger Einstein observatory, both launched by NASA, and more recently the very successful European ROSAT whose name (Roentgen-satellite) honors the discoverer of x-rays. Some x-ray sources seem associated with strange binary stars and black holes, others still puzzle us, but all suggest a source of high-energy particles. The X-rays used by the doctor to spot broken bones and impacted teeth are valuable because they penetrate matter, the way light penetrates a windowpane. To produce sharp images of X-ray stars in the sky, on the other hand, X-rays must be focused. It seems like an impossible task, but it isn't--because when X-rays strike a surface at a flat angle, they are reflected, same as light off a mirror. Like a flat stone tossed at the surface of water, they bounce off when they hit at a shallow angle, but go through if the angle is too steep. That too was the design principle of the orbiting Chandra, named for Subramanian Chandrasekhar, an Indian astronomer who became one of the leaders and oustanding teachers of the US astronomy community. The "Chandra" orbiting X-ray telescope was launched from the Space Shuttle on July 23, 1999, and it focuses X-rays from a series of ring-shaped mirrors. Imagine you cut off the tread of a tire, to produce a ring with a curved cross section. The "Chandra" telescope has metal focusing surfaces shaped like the inside of this ring, and by shallow reflections they bring X-rays to a focus. Of all the high-energy photons beamed at us by the universe, probably none are more puzzling than those emitted in gamma ray bursts. In the 1960s the US launched a series of spacecraft with accurately timed gamma-ray detectors, to monitor nuclear tests in space and later to enforce the international ban on such tests. The idea was that by having several well-separated satellites note the exact arrival times of the radiation (gamma rays travel at the speed of light) the sources of radiation could be pin-pointed. The spacecraft indeed observed brief bursts of gamma rays, but the timing suggested that they came not from Earth but from deep space. Later some fairly accurate "fixes" were obtained for a few events and powerful telescopes were trained on the indicated locations, but they saw nothing remarkable there. There exists no generally accepted explanation for gamma ray bursts. Some promising theories were abandoned when NASA's Compton Gamma Ray Observatory satellite (CGRO) found in 1991 that they seemed to occur equally in all directions. Had they originated in our own galaxy, they would have probably been concentrated in the direction of the Milky Way, where most of our galaxy's stars are found (the galaxy is a flattened disk, and when we look at the Milky Way we see it edge-on). The new evidence suggests that they could come instead from distant galaxies, and if so, their sources must be incredibly powerful. On March 2, 1997, the Dutch-Italian satellite BeppoSAX ("Beppo" was the nickname of the late Italian physicist Ochialini, after whom the orbiting observatory was named) reported a gamma-ray burst, and turned its x-ray telescope to the region. The X-ray telescope reported a continuing source of X-rays, and NASA's orbiting Hubble telescope (as well as the Keck Observatory on the ground) observed a visible "star" at the appropriate location, probably a distant galaxy. So far no definite conclusions have emerged (see Nature, 17 April 1997, p. 650). Since then, other sources were identified visually, some by amateurs. (Update 11-24-04) The riddle of the source of gamma ray bursts led astronomers to design and build a space observatory, designed to pin down and observe the source of bursts within seconds. That observatory was launched by NASA on November 20, 2004, under the name SWIFT, and at its heart if BAT, the Burst Alert Telescope, a gamma-ray detector covering 1/6 the sky and capable of deriving (within 10-20 seconds) the position of a gamma-ray burst, within 1-4 minutes of arc. It orbits about 600 km above the ground. That position will be transmitted to ground observatories which--weather and position on the globe permitting--will immediately turn to the indicated location. Meanwhile SWIFT itself will orient itself, using momentum wheels, so that its two telescopes will also observe that spot--an X-ray telescope (XRT) and one in ultra-violet and visible light (UVOT). The X-ray detector will derive a spectrum in about 20 minutes, and will at other times conduct a survey of sources of "hard" (high-energy) X-rays, with a sensitivity 20 times of the best earlier observations. UVOT has a 30-cm wide telescope and sensitive detectors; using filters, it will go through a 2-hour cycle after an event. SWIFT can also be rotated on command to observe a gamma-ray burst seen by another satellite in a different part of the sky. In addition to the "ordinary" variety of gamma ray bursts, originating in distant galaxies, there exist brief bursts which may originate closer to home, in our own galaxy. One of those, surprisingly powerful, reached Earth on December 27, 2004. It was intense enough to saturate most detectors aboard "Swift," described above, and it lasted about half a second, but its effect on the ionosphere above the Pacific Ocean interfered with communications for about an hour. About 15 satellites around Earth detected it. The source of this burst was pulsar SGR 1806-20, already being monitored because of its strong magnetic field. Pulsars are remnants of supernova events, the collapse of massive stars which have used up all their nuclear fuel. Such a star, if is massive enough (our Sun apparently does not qualify) enters a rapid runaway nuclear reaction, which drains almost all their gravitational energy, a huge amount. It leaves behind a "neutron star" a few kilometers across, a rapidly rotating assembly of neutrons with a density like that of an atomic nucleus and a mass of the order of the Sun's. In the compression process, any magnetic field present can get greatly amplified. As explained elsewhere, in a plasma which conducts electricity well (as it does in a collapsing star) magnetic field lines behave as if they were "frozen" into the material which they permeate. If that material gets compressed, the same lines occupy a smaller space at greater density, which means, the magnetic field becomes much more intense. For example, if the dimensions of the field decrease 10,000 fold, the cross-section of any "tube" formed by magnetic field lines shrinks 100 million times, and the magnetic field inside the tube becomes 100 million times more intense. The star SGR 1806-20 apparently had a respectable magnetic field when it began collapsing, and as a result, it ended as a neutron star with an enormously intense magnetic field, a "magnetar". Such stars in our galaxy (about 10 are known) sometimes emit gamma ray bursts. This one had previously emitted small bursts, and two appreciable events were recorded in 1979 and 1998, but the latest one outdid them by about a factor of 100. How the gamma rays were produced can only be guessed, but magnetic energy must be involved--it also seems to be associated with to the acceleration of particles on the Sun, and particle acceleration is probably essential to the production of gamma rays. Some believe that stressed magnetic field lines, twisted by rotation (which is also enormously amplified when a star collapses) managed to suddenly "unwind" to some extent, like an overly wound-up spring working loose. The star is about 50,000 light years from Earth, and astrophysicists are beginning to wonder whether some short gamma ray bursts, detected from distant galaxies, might not represent similar events there. Further Notes: This event was described in the "New York Times" on 2-20-2005 and on p.1178 of the issue of "Science" of 2-25-2005. A more detailed and technical discussion of this event is in the article "Record Gamma-Ray Flare Is Attributed to a Hypermagnetized Neutron Star in Our Galaxy" by Bertram Schwartzschild on page 19 of the May 2005 isssue of "Physics Today." Scientists will find interesting information in 5 articles in the 28 April 2005 issue of "Nature, p. 1098-1114. The December event is also discussed here. For an earlier discussion of magnetars in our galaxy, see here, including references to a previous event on 27 August 1998, originating at an estimated distance of 20,000 light years. Radio waves from space were discovered accidentally in 1932 by Karl Jansky, a radio engineer with the Bell Labs. Since then many radio telescopes have scanned the skies and have discovered remarkable sources of radio and microwaves. Often they seem to indicate high-energy particles; for instance, some sources associated with distant galaxies suggest particles trapped in enormous magnetic structures. Some come from the center of our own galaxy, where linked radio telescopes thousands of miles apart have pinpointed an extremely compact source, now identified as a giant black hole. Perhaps the best known sources of this class are pulsars, sources of radio pulses whose repetition rate is extremely regular. They seem to be "neutron stars," collapsed remnants left behind by supernova explosions, stars as massive as the Sun but as dense as the atomic nucleus, no larger than 8-10 miles across. The collapse also greatly amplifies any existing magnetic field and speeds up enormously the star's rotation, creating compact stars which rotate about once a second, sometimes faster, with extraordinary strong magnetic fields. It is believed that the radio pulses come from particles spiraling in those fields and that they are beamed in directions dictated by magnetic field lines. Thus as the pulsar rotates its radio beam, like the light-beam of a lighthouse, sweeps again and again past the Earth. The pulsing rate has been observed to decrease very slowly, suggesting processes which gradually slow the rotation down. The most recent supernova in the Earth's part of the galaxy was observed in China in 1054. It left behind it a peculiarly looking glowing cloud, the Crab Nebula, whose central star was recently revealed as a very rapid pulsar, with a radio signal pulsing about 30 times a second; it also pulses in visible light and in x-rays. The light of the nebula itself is polarized (vibrating in a certain ordered way), again suggesting electrons of very high energy spiraling in a magnetic field, and the nebula also contains many bright filaments (picture), which might well be magnetic in origin. Theorists have speculated that the only way particles can escape the powerful magnetic trap--and radiate signals as they do--would be along the rotation axis, which by necessity is also the magnetic axis. 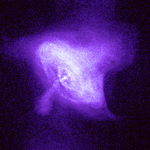 The image on the right, taken of the Crab nebula by the orbiting "Chandra" telescope (see above) seems to fully confirm that view. High-energy electrons in the magnetosphere also emit x-rays and radio waves, in their own style. Positive ions, being heavier, tend to move more slowly and to radiate less efficiently. To produce x-rays or gamma rays, electrons must collide with some more massive target. In a doctor's x-ray machine, for instance, they are shot onto a chunk of metal, inside a vaccum tube (electrons hitting the screen of a TV picture tube also produce x-rays, but these are absorbed by the glass). Out in space collisions are very few, but x-rays are produced when beams of auroral electrons hit the atmosphere. In 1957 instruments of the University of Minnesota, carried by a balloon to the upper fringes of the atmosphere, detected x-rays emitted by auroral electrons many tens of miles above them. The recent "Polar " satellite carries an x-ray imager, highlighting regions in which auroral electrons are particularly energetic. The pictures produced are much less detailed than the ones in visible and ultra-violet light, from the other auroral imagers on "Polar." These latter images are particularly useful when the satellite is far from Earth, because their images then cover the entire polar cap; but rather detailed x-ray pictures have been obtained from the other end of the orbit, when "Polar" sweeps down, observing the auroral region at close range. Many different types of radio emissions are generated by ions and electrons trapped in the magnetosphere, but few can be detected from the Earth's surface, because the ionosphere, at 100-300 km above our heads, usually reflects them back into space, just as it reflects back to Earth broadcasts of short-wave radio stations. However, in July 1962 a high-altitude nuclear test by the US created a dense temporary radiation belt of fast electrons, and radio noise from the new belt was then detected on the ground. Even earlier, in 1955, strange radio signals were found to come from the planet Jupiter, greatly puzzling radio astronomers. The source turned out to be the planet's immense radiation belt. The fact that some of the emissions were found to be controlled by the position of the satellite Io is probably related to the electrical currents linking Io to Jupiter. The space probes which have visited Jupiter--Pioneers 10 and 11, Voyagers 1 and 2, Ulysses and most recently Galileo--have observed at close hand many types of radio waves, beamed in interesting modes which still defy explanation. The first four went on to Saturn, and Voyager 2 continued to Uranus and Neptune, all of which were found to be magnetized, have radiation belts and emit radio waves. The solar system thus has magnetosphere beyond the Earths, waiting to be explored, differing from ours by the presence of moons and rings and by other features. Satellites orbiting outside the Earth's ionosphere record a veritable "zoo" of radio emissions, not all of them understood. Most intense is the "auroral kilometric radiation" originating above the aurora ("kilometric" is the order of magnitude of its wavelength, below the AM radio band). The "antenna processes" by which these waves originate are profoundly affected by the surrounding plasma and by the way it interacts with the magnetic field. Such waves therefore provide valuable information about magnetospheric plasmas.